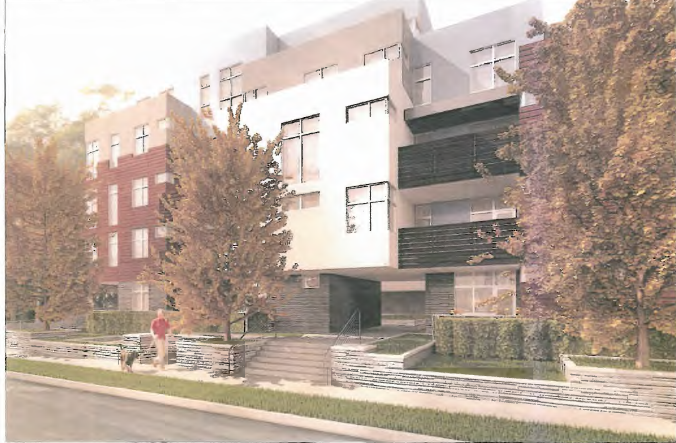 The West Hollywood Planning Commission last night approved construction of a five-story, 34-unit building on Norton Avenue that will replace 21 apartments where rent increases are governed by the city’s rent stabilization law. The Commission’s vote came after a hearing that brought complaints by neighbors of the project and by local anti-development activists. Last night’s meeting showed a shift in the position of some activists, such as Cynthia Blatt, founder of UNRED, an organization that campaigned to block construction of a 25-unit building at 826 N. Kings Rd. That project also was approved by the Planning Commission. Blatt and others have argued in the past that the city doesn’t need more housing for low- and moderate-income people and that such housing should be built elsewhere — an unpopular position in a city founded by advocates for rent control and affordable housing. Among other things, the anti-development activists have cited the fact that the city has surpassed the state Regional Housing Needs Assessment program’s requirement that West Hollywood provide 77 units for people whose incomes range from very low to slightly above the moderate level. But during the discussion of the Norton Avenue project, anti-development activists argued that the project would eliminate 21 rent-stabilized housing units and replace them with five affordable housing units. Blatt also argued that the city shouldn’t allow developers to build larger buildings in exchange for providing affordable housing in a project. Under city law, 20 percent of the housing units in a building of 10 or more units must be set aside for low- to moderate-income people. In exchange, the developer has the opportunity to request exceptions to various zoning restrictions on the size or height of a project. Blatt told the Planning Commission last night that the city instead should require developers to make a payment into a fund the city can use to pay for construction of housing for low- and moderate-income people. Nearby residents raised objections ranging from the height of the building to the possibility that it might block their views. The proposed project, which straddles three lots at 8029 – 8031 Norton Ave. between Crescent Heights and North Laurel, is developed by Craig Berberin’s Empire Property Group. A Berbian representative said that the project would likely consist or rented apartments and not condominiums. Mark Lehman, a lawyer representing Empire, contested claims that 21 rent-stabilized housing units will be replaced with a project that offers only five affordable housing units. For one thing, he and other supporters of the project noted that rent-stabilized and affordable housing units are not interchangeable. Rent-stabilized units are those where the landlord cannot increase the annual rent beyond a percentage set each year by the city’s Rent Stabilization Committee. When a rent-stablized apartment is vacated, the landlord can raise the rent to the market level. Affordable housing units are those whose rent or purchase price is set according to the tenants’ income level. A representative of the developer also said that some of the existing housing units on the Norton lots are dilapidated and unoccupied. In their staff report, members of the city’s Community Development Department and Stephanie Reich, the city’s urban designer, noted that the architect for the project had made significant changes from an earlier proposal. Among those changes was change in the facade that made the building look less bulky. The street-facing facade is only three stories high, with the fourth and fifth stories set back on the building. State law–the Ellis Act, which supersedes City law, allows a landlord to permanently go out of the rental business & the City has no say over that. And while the City may be losing those 25 units of rent stabilized units, again, because of State law (Costa Hawkins), when any rent stabilized unit in West Hollywood (anything build before 1978, I believe), becomes voluntarily vacated, the landlord can raise the rent to whatever they want. With this new project, the City has a net gain of 5 permanent affordable units–they can never to go market rate & they can never be Ellised out. Ms Blatt should be (but I’m sure she’s not) ashamed of herself. It’s the same thing we heard back with the Laurel Avenue project—“we’re not opposed to affordable housing, just not here”. There was a great 3 part series on HBO last month about the fight over affordable housing to be built in a city in New Jersey–a true story. It was contentious, threw the City nearly into bankruptcy, destroyed friendships & you know what, all the units got build & the community ended up being fine with it. Unless The City continues to build affordable housing or require inclusionary units, we will fast become a City of “haves” and no one of any other financial means & I for one, love having a wide, diverse population in The City. Yes…Moderate Income is open. But the majority of “low-income” folks don’t qualify because one has to make at LEAST $46,155 and goes up to $57,693. This is a silly category because you can find rent on this salary. And when was the last time you saw a building that was only accepting middle income? I never have. As for the low income…those lists have been closed a long time. Even 5 years is very lengthy not to even be put on a waiting list. Still no one answers the question as to who gets these “low income” apartments when there are only 2-5 apartments in new development. The John Stewart Company oversee’s Inclusionary Housing and the WHCHC puts in bids to “acquire” the low income apartments..but I assume they don’t always get them. What happens to them? I think there needs to be some oversight and a clearer trail of what happens to these apartments. Wow, there are so many reprehensible views and misconceptions expressed here – I choose not to go at them one by one as I would be here all day. First, the waiting list has not been closed forever. As a matter of fact, when the Sierra Bonita building was first occupied 5 yrs ago, they started over with a lottery on the low and very low income list. I may be mistaken, but I believe that I am correct in saying that the middle income list has been and is open now. Do you see the homeless people all over the place in LA? 50,000 plus or minus – and West Hollywood has always prided itself with being an example to the rest of the country with our 80/20 set aside of units for low income residents. Several large municipalities also have this requirement, NewYork, Chicago. San Francisco, Portland, to name a few. Because housing is such a crucial springboard for improving one’s life, health, and ability to take care of one’s self, and study after study have shown that housing an individual leads to a dramatic cost saving to the public health and law enforcement agencies, it is by far the most effective intervention we have. In LA, the DHS’ Housing and Health program has in 18 months taken 1000 people off of the streets, and is ahead of their goal of 10,000 total in the next 3.5 years, has data that indicates an annual health care cost savings of $27,000.00 per person housed. In my opinion, city life improves if its citizen’s lives improve. The last comment on which I wish to share is the call for ‘more windows or something’ – just an FYI, there are state regulations regarding the amount of glazing(window) square footage one can have as it relates to floor space. This is to ensure minimal heat and cooling loss and control of energy costs. So, its not that simple, unfortunately. Ok, I misstated above when I said the last. The person who complained about their view changing need to realize that not only was an eternal view ever guaranteed in our charter, but you live in a city, which by nature changes. If you want an unchanging view – either buy all of the properties around you or move to the middle of a field in the country. BC, what are you saying?!!! The consequences of rent control are coming home to roost in West Hollywood, one unimaginative project at a time. If Ms. Blatt’s has time on her hands, perhaps she could help crack the nut containing the intersection between affordable housing, rent stabilization, code compliance and the general loss of housing AND residents who don’t have much of a life preserver. Surely her experience in housing could be useful to the city folks heading up those departments. More than endless arguments we need verifiable steps toward a solution on a dedicated time line. To say that this project is a travesty is an insult to actual travesties. Last night it was easy to see how capricious, arbitrary, uninformed and inconsistent the Planning Commission appeared to be. The commissioners believed the Norton Project was a by right development with all the correct boxes checked. Unfortunate they were ignorant and/or oblivious to the elephant in the room, a concept which has been adequately addressed by the code. It seemed a love fest composed of posturing commissioners, an ego driven developer devoid sensitivity and an architect under heel who was recently thrown on to he rocks when one of his other projects was denied by the commission in just such a conundrum. Even the inconsistency between the comments on Norton the San Vicente project earlier on the agend were striking. Ms. Blatt’s objectives also appear capricious and only served to create a messy situation. It would help if commissioners brought thoughtfulness and excellence to the table and had the backbone to question issues below the surface and those so obvious they can’t adjust their vision to comprehend. No one knows everything but one always learn more through probing questions and analysis. Otherwise it’s just plain stupidity. I dont understand the process for affordable housing. So all these new apts. will rent for at least $2000+. So we just displaced 21 people. The 5 affordable housing units I’m guessing will be subsidized by the city like Section 8 and offered only through the “waiting list” which has been closed forever. Or does the management company for this new building set the rates for what is affordable and they get to pick whom to live in the lucky 5 units? I don’t have a position on this project, but thanks for exposing the hypocricy on the UN-RED NIMBY activists. The larger questions is development at what cost, WEHO needs regulated controlled affordable rental units not more big priced rentals or condos. What is the effect of all this unbridled development on the very fabric of our neighborhoods, who has to move out and who moves in? Last nights meeting should be a warning sign to the “Staff” and “Planning” that these barely critical recommendations to the commission with the most minimal modifications are not going to be acceptable and will be met with a brewing resistance. The Planning commission abdicates its responsibility of interpretation and analysis as it rubber stamps project after project. Its time for a real housing coalition to rise up and reformulate the objectives, craft and modify development or we will all be living among big priced condos and hotels. I think they will likely be rental units, not condos, as most of the apartments don’t have private outdoor space. Instead, there is a common outdoor space. These new units will change the entire nature of this block of Norton. Once built, the development value of the surrounding properties will be more than the value of the older rental stock and will likely be sold out, one by one, to developers. To my eye, this design looks like it could be anywhere. Santa Monica, Palms, Woodland Hills, etc. Since these are going to get built, I just wish the design could be something more interesting. More windows, a more recognizable style… something. Look at the condos to be built on Doheny. These at least have far more visual appeal and a very modern, international style with a tip to mid-century modernism. These condos will be an architectural gem. I can’t say that for this new building on Norton. Also, I only heard a few people mention the fact that the prior owners/landlords of the three buildings being demolished allowed their buildings to deteriorate making conditions miserable for tenants. This shouldn’t be allowed to happen, but it is happening all over West Hollywood.